Union Trust Bank (UTB) Saturday, 13th October, opened a new Western Union outlet at Abijaoudi Enterprise, Zara Lane, Peninsular Circular Road, Goderich, Freetown. 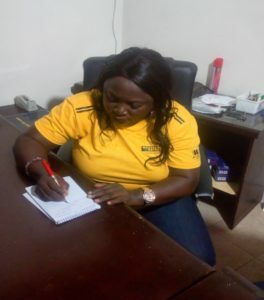 Speaking at the ceremony, Senior Sales Manager Western Union, Agnes Mansaray, said the establishment of the branch was to provide their customers at the peninsular with the best banking system. Ms. Mansaray said they are everywhere in the country and that they have many customers around the Goderich community who have been finding it difficult to access their facilities, hence the decision to establish an outlet at Abijaoudi supermarket. She said their customers had been having difficult to bank with them due to the distance they had to cover, while many lost their monies on the way home. She informed the crowd that every customer who wanted their relatives to them send money should do it through Western Union. She added that their banking system was the most reliable and affordable because they have the fastest internet facility to send and receive money. She maintained that if any of their customers want to collect or send money, they must possess a valid National Identification Card or Sierra Leone Passport or Voter’s Identification Card or Driver’s Licence or NASSIT ID card. The Sales Manager noted that they do not accept student identity card because of what she referred to as authenticity deficiency. She concluded that the Abijaoudi supermarket would be opened from 7a.m. to 7p.m. through Monday to Saturday. Manager of the supermarket, Gebran Abijaoudi said he was happy and ready to work with the bank and all other customers around the Goderich area. “It is our responsibility to make sure that the customers are happy when banking with UTB and I promise that I would do my best to keep the customers happy,” he said.